Bring shoes you already own and you know are comfortable. This might sound like weird advice from “personal shoppers” but use what you own before running out to buy new. Chances are you have the shoes you need in your closet, and you already know which ones are comfortable and supportive and you can walk miles in. That’s important stuff, walking down the Champs Elysee is not the time to break in your new pair of kicks. That being said, there are some really great shoes out there that are good for everyday and perfect for travel, so we’re highlighting our faves. If you do buy new shoes, try to wear them at home first to break them in and make sure they’re comfy. All you need are three pairs of shoes. Yep, that’s all. For summer that means: sturdy sandal, sneaker, block heel sandal/bootie. And for fall winter just replace the sturdy sandal with a sturdy walking shoe – that can be a lace up or bootie, whatever is your most comfortable go-to. If you’re going to a beach destination throw in a flip-flop for the beach. They don’t take up much room and it stops stubborn sand from permeating your everyday sandals. 5 Things to Look For in a Travel Shoe. 1. Look for a Sturdy Shoe. You want it to be sturdy and supportive. Nobody wants aching feet or backs from yucky shoes. Go for flat or flatform bottoms so you’re not wobbly on cobblestone or any other kind of pavement that isn’t your average sidewalk. Meaning keep your foot mostly covered. They are better in wet weather, to avoid foot sunburn, and in large crowds. Have you ever been stepped on wearing flip flops? It hurts, right? Yes, people, you can be both comfortable and fashionable at the same time. It’s best to find a shoe that you can wear for an entire day of touring and traveling. You don’t have to want to stop along the way to change your shoes because of blisters. (But if you do, we swear by these.) If you opt for sneakers during the day try some of our favorite socks with them. 4. Leave Your Pumps and High Wedges at Home. Unless you’re walking the red carpet in Cannes, your stilettos can stay at home. 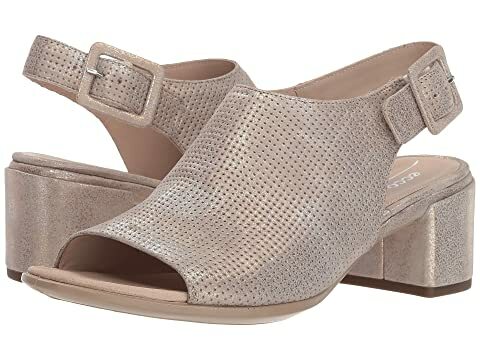 Instead, opt for a block heel which won’t get stuck in concrete or cobblestones. And they’ll give you a lift while offering support to keep you stable. 5. Choose neutral color shoes. Neutral color travel shoes will go with a lot more which will also help to consolidate in the shoe packing department. Tans, blacks, grays and whites mix and match with other neutrals as well as denim and florals to give you lots of options. The 3 Essential Travel Shoes for any Destination. This is our latest obsession. 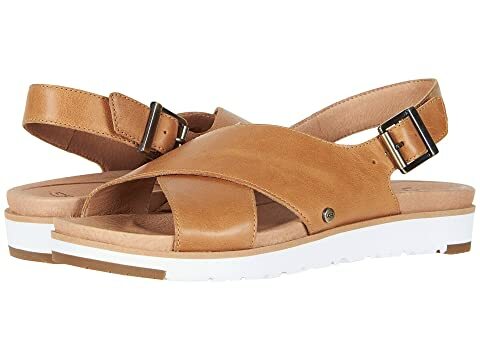 It’s the perfect walking sandal that’s both functional and fashionable. Fyi…It runs true to size and is super comfortable. It’s tried and true. Style Tip – wear these with shorts, jeans or a day dress to stay cool and look polished all day long. This ultra lightweight mesh sneaker is a great every day travel shoe. The metallic gray adds an extra cool factor and makes it more special than your everyday gym shoe. Style Tip – wear these as part of your travel outfit for chic comfort on planes, trains or automobiles. A cross between a bootie and a sandal this one is great with dresses and pants. Bonus, it comes in 4 different colors. Style Tip – Think of this as your evening shoe. It’s a step up from your sneakers or flat sandals but totally walk-able. Thanks so much for this post! Since I began using your advise “choose shoes first “ …packing is easier! You go girl!! 4 pair of shoes?? Woot woot! Yea, the Stan Smiths are amazeballs! !